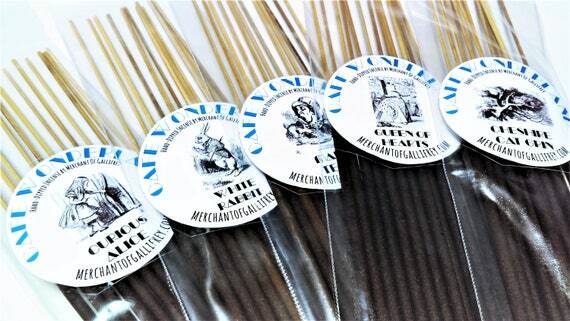 Freshly baked and debuting today is my Cafe Wonderland line of hand-dipped incense. Check out the menu and see if anything sounds yummy. //Curious Alice// – lemon and raspberry petit-fours. //White Rabbit// – lemon tarts, peony, and rose. //Mad Tea// – bergamot, black tea, buttery banana and nut scones. //Queen Of Hearts// – red rose, tart apple, cinnamon, and chai tea.